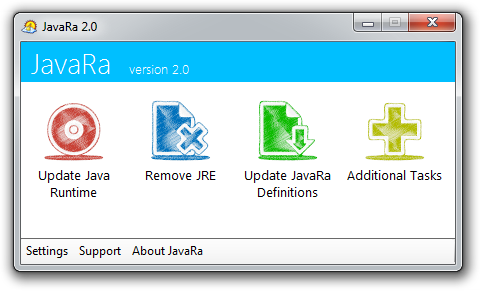 JavaRa is an effective way to deploy, update and remove the Java Runtime Environment (JRE). It can assist in repairing or removing Java when other methods fail. JavaRa is no longer receiving updates. Please see the ‘Retiring JavaRa‘ post for more information. Its most significant feature is the JRE Removal tool; which forcibly deletes files, directories and registry keys associated with the JRE. Java software in general and the Java JRE in particular; allow you to run applications called ‘applets’ that are written in the Java programming language. You probably have Java JRE installed on your computer because these applets allow you to play online games, chat with people around the world, calculate your mortgage interest, view images in 3D, as well as many others. Java and Java Runtime Environment (JRE) are trademarks or registered trademarks of Oracle America, Inc. in the United States and other countries.